Pokemon Pearl and Diamond will have VOIP compatibility and a total of 480 Pokemon - GameSpotting! Posted on March 15, 2007 by MASA. Categories: DS, DSL, Gaming, GBA. Nintendo has released details that the new Pokemon Pearl and Diamond game will have the ability for you to talk to your opponents while battling, in the waiting room, after the battle, and just about any time while you are on Wi-Fi. But in order to talk you need your friend’s Friend Code and they need yours. This Pokemon game is the first to have all the previous 380 Pokemon from the past PkMn games, plus 100 new Pokemon which brings the total count up to 480 Pokemon. And the cool part? If you own the old GBA Pokemon games, you can import those Pokemon that you caught from the old versions to Pokemon Pearl and Diamod (however to do so you must get an item first). To seal the deal, Nintendo will throw in a “collectible” stylus (there are two total, each one has one of the Pokemon on the cover of the box) if you pre-order the game after March 18th. 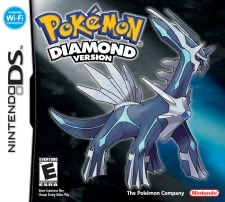 Pokemon Pearl and Diamond come out on April 22nd. This article is currently on Digg, if you like it, please digg this by clicking here.